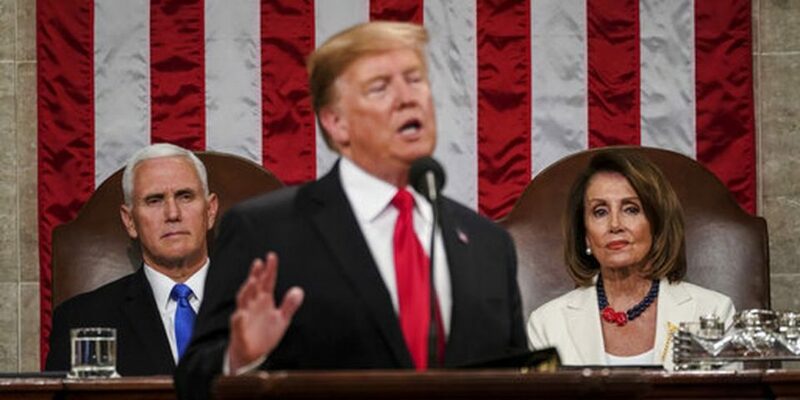 New York, Feb 6 (IANS) President Donald Trump has said that he wants immigrants to come to the US in “largest ever numbers” legally, as he declared during his State of the Union address his determination to build the controversial border wall to deter illegal immigrants and smugglers. His showdown with Speaker Nancy Pelosi, a Democrat, over funding for the border wall resulting in a 35-day government shutdown, delayed his speech by a week after she withdrew her initial invitation to speak. Trump ultimately backed down with a truce to allow the government to reopen temporarily to negotiate a deal with a February 15 deadline. He threatened to declare a State of Emergency if he did not get $5.7 billion funding for the barrier along the Mexico border and would use defence funds and the military to erect it. Trump devoted a significant part of his 82-minute speech to illegal immigration and border security, pressing his demand for a wall and mocking “wealthy politicians and donors push for open borders, while living their lives behind walls and gates and guards”. Democrats immediately turned down his demand, steadfastly standing by their rejection of the wall. Calling for “compassionate treatment at the border”, she said: “Democrats stand ready to effectively secure our ports and borders” but her party leaders were against a wall. An African American, Abrams narrowly lost the Governor’s election in Georgia last year and her unusual choice was to reinforce the gulf between Trump and the Democrats. At the same time, he attacked the several inquiries directed against him and his presidential election campaign that Democrats say was tainted by Russian interference. While Republicans cheered him right through the speech, some Democrats joined in only sporadically. Democratic Party’s women legislators, Pramila Jayapal among them, were dressed in white recalling the suffragettes — the campaigners for women’s right to vote — and sat stonefaced through most of the speech, even when at times Pelosi stood up to applaud. There are 131 women in both chambers of Congress, making up just under a quarter of the membership. Thirty-five of them were elected for the first time last November. Trump packed the speech with drama recognizing people present in the audience at appropriate points in his speech, such as astronaut Buzz Aldrin when he spoke of the 50th anniversary of the landing on the Moon this year, or family members of victims of illegal immigrants when he mentioned crime from unchecked borders, or a 10-year-old girl who raised money for a children’s hospital as he spoke about funding cancer research for children. In an unprecedented moment of spontaneity, the entire audience erupted in singing “Happy birthday” to Holocaust survivor Judah Samet when Trump mentioned it was his birthday. Samet had also survived the attack on a synagogue in Pennsylvania last year that killed 11 people and Trump drew attention to him when he denounced anti-Semitism. Trump said that his budget would include a nationwide plan for paid family leave. Trump announced a plan to end the spread of AIDS — which he termed an epidemic — in 2020 and a 10-year $500-million programme to fight childhood cancer. The President blamed US leaders and representatives for the deep trade imbalance with China and its theft of US intellectual property. He said that his administration had brought down prices of medicines, saying: “It is unacceptable that Americans pay vastly more than people in other countries for the exact same drugs, often made in the exact same place. Pharmaceutical companies follow a two-tiered pricing system that sets prices according to differing economic status of countries or local regulations. On defence, he said that he was increasing the budget from $700 billion to $716 billion and had secured an increase of $100 billion in the allocations of US allies “to pay their fair share”. He said he had a good relationship with North Korean leader Kim Jong-un and will meet him in Vietnam on February 27 and 28. He defended his plans to withdraw troops from Syria claiming that the Islamic State terrorist group had been defanged thee and in Iraq.